As you may or may not know, one Colorado winery has some serious California connections. In 1976, W. Reed Foster helped found the icon Ravenswood winery. A few decades later, his son Glenn worked as a winemaker at several small wineries in Colorado. 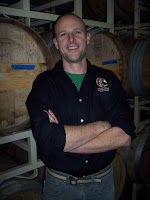 In 2008, after owning and operating a retail store in Fruita, CO, Glenn bought three small wineries of his own. As the Talon Wine Brands grew, Glenn brought on a second winemaker. Brian Stevens was an elementary school teacher and home brewer, but is now the winemaker for one of the state's largest wineries. I like to say it was providence- the idea that I was guided by divinity into this business, but the truth is that I just can’t stay away from alcohol! I got my start as a homebrewer, making lots of beer for about the last 10 years or so. This was where I really cut my teeth, so to speak. I found that you become really aware of what you’re doing- right or wrong- when you have complete ownership in it, and it motivates you to figure things out. My wife and I moved to Colorado in 2009 and I started looking for another teaching job. I was incredibly fortunate to meet up with Glenn Foster (Owner and Head Winemaker for our three brands) and really get my start commercially from the ground up. I truly couldn’t have asked for a better mentor- Glenn has a depth and breadth of experience that is quite unique. I’d probably go back into early retirement- I took some time off work voluntarily after we moved here to do some mountain biking and renovate our 103 year-old Farmhouse. I taught elementary school for four years before we moved, and I could go back into that pretty easily- it was one of the most rewarding things I’ve ever done. Honestly though, I love what I do, so what else would it be? Ha! Crush is a pretty good time to think about what I’ll do when I get away. These days I’m spending quite a bit of time here destemming, pressing, fermenting and monitoring new wines. This week it’s been a little hard to catch my breath, but there is a light at the end of the tunnel. I’m a pretty terrible mountain biker, so any extra time I have is devoted to as much riding as I can stand. Our house is still a work in progress, and I really need to devote lots more time to fly-fishing. I don’t have any weird collections or anything, so it’s just the usual- hiking, canoeing, etc. Honestly, I am really happy to be in Colorado. I know that doesn’t answer your question. I could go somewhere else and make more money, or deal with different varieties, but at the end of the day, the Grand Valley meets more of my criteria right now for a balanced life. Plus, thanks to the efforts of our local Visitors and Convention Bureau, Colorado Tourism, and passionate bloggers, our reputation as a wine region is growing. I shared a bottle of 1978 Château La Mission Haut-Brion with some very special people during my last trip to California, and it was marvelous. I’ve never tasted anything like it. I believe, and I think most people feel the same way, that sharing is really the thing that elevates wines from great to marvelous. This is a great question. I’d say we have an eclectic style. Considering the diversity of our line-up, I tend to think we’re like the Beatles’ White Album. This was the first album to show that a group could have mastery over a wide range of styles- the beginning of musical eclecticism, if you will. We do many different styles really well, from a Bordeaux-style Red, to our Meads, to the Fruit Wines- they are our Ob-La-Di, Ob- La- Da. Right now, I see some amazing potential for growth- I think our producers are growing and making better products across the board, from the fields to the glass. I see us earning more and more national recognition and definitely making more of a name for ourselves. I’d like to know what your expectations are of us- from a consumer perspective, what can we do better? Mr. Stevens has an broad and nuanced understanding of wine, and the wines he has a hand in are excellent!